Sacred Stones & Crystals inside each product. Crystals, gemstones and essential oils all vibrate at different frequencies. When these elements are combined it creates a synergetic compound that assists you in bringing peace and harmonic balance to your mind, body and spirit. Our signature StoneVibeEssence™ process combines the natural cleansing and protective properties of semi-precious stones, crystals and minerals with the natural therapeutic benefits of essential oils. Simply Sacred Oils™, has developed eight Chakra specific formulas that will work with you to bring about your chosen results. Applied to the appropriate area or chakra energy center, the oils become the vehicle that unlocks cellular memory, the blueprint for your existence. This allows you to access and strengthen the emotional, cellular and spiritual connection, creating balance and harmony in your life. Our Intention is to break down the information in an easy way to demystify the Chakra System by creating a kit that includes a chakra chart, directions and sample mediation and affirmations, this allows you to follow a simple step by step method to a balanced body, mind and spirit. 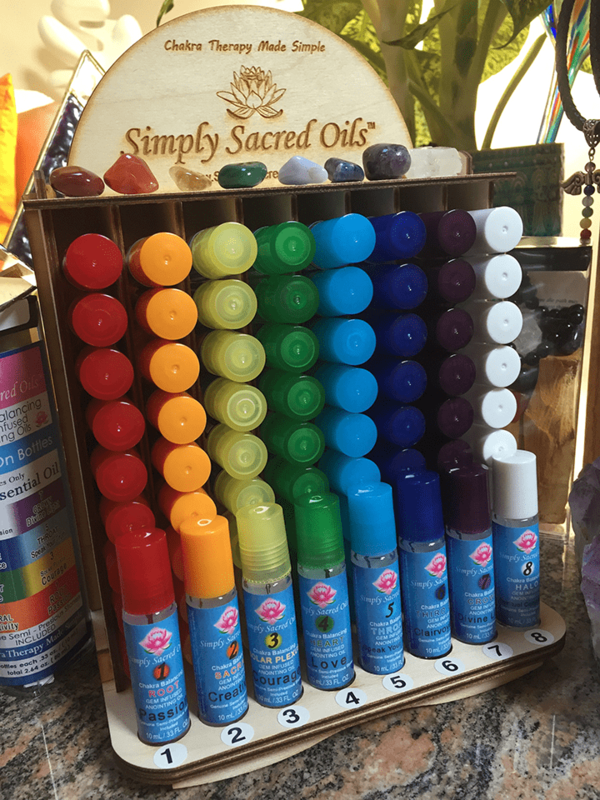 Simply Sacred Oils™ has developed a numbered and color coordinated series of anointing oils to allow you to clear, open and understand your physical and emotional body. Each oil is hand crafted with sacred ingredients specifically designed to balance each of your energy centers. Simply Sacred anointing oils have been designed to naturally incorporate the ancient therapeutic benefits from both essential oil and stones- minerals and crystals. 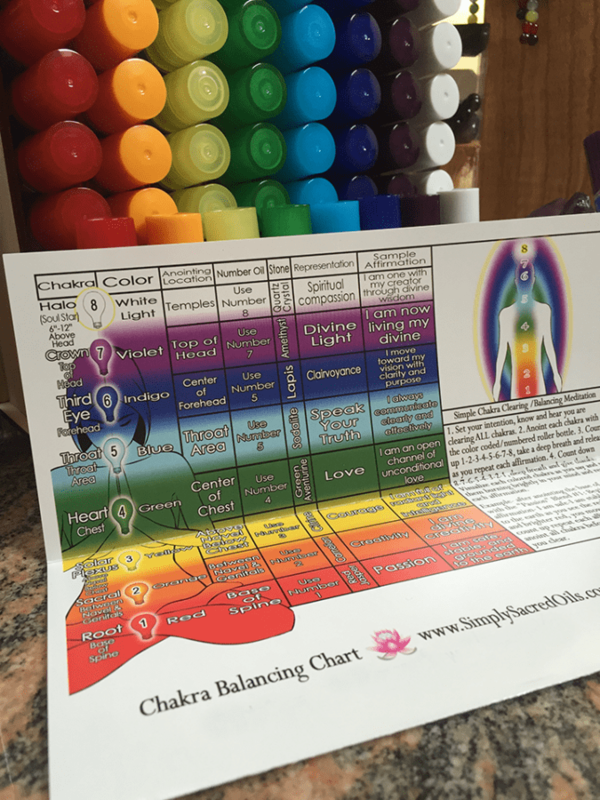 Why is it important to have balanced chakra’s? Located right outside the body, the aura is the electromagnetic extension of these centers that surround the physical body and usually vary in color. The aura is also known as your Spiritual Signature. To Be Balanced is to be healthy and clear, physically, emotionally and Spiritually. By being clear and focused this allows you to retrieve information connected to your souls purpose. By being balanced it allows for the free flow of synchronistic energy. 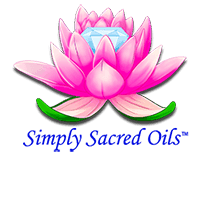 Simply Sacred Oils™ uses the purest and highest quality essential oils to maximize its effectiveness. Its additional therapeutic benefit is enhanced by its ready absorption into our bodies. As a result our Simply Sacred Oils™need not be diluted to be safe and effective, ensuring you have the best possible experience in awakening your spiritual connection. From the time I was very young, my life has been heavily influenced by my spiritualism, natural curiosity and my passion to improve my world. The universe has drawn me to numerous gifted individuals whose abilities transcend our five senses. Many have demonstrated the verifiable ability to communicate with friends and family who have passed from their earthly existence. Others have demonstrated a phenomenal accuracy at prognostication. Others are tapped into the energy fields of everything on this earth, including our bodies. These mentors have helped direct me along my journey and provided focus when my attention strayed. Through their intercession, I have received guidance and encouragement that continues to shape my work and has taught me many valuable lessons. For example, my most recent endeavor began with my own injuries from a lifetime of physical activities. Over the past several years I have been recovering from knee and hip replacement surgeries, always striving to utilize the healthiest alternatives to pain management. I found that application and aromatherapy of pure essential oils was very effective with accelerating my recovery and overall perspective. This led me to reach out to my friends and confidants that have extensive knowledge and a combined 60 years’ worth of experience with essential oils on the one hand, and crystals, minerals and gem stones on the other. I immersed myself in extensive research exploring the enormous benefits of combining these two sacred forms of therapy, which led me to the development of my own brand of gem infused essential oils, Simply Sacred Oils™. I found much of the information in the books and research esoteric and difficult for me to grasp, so I made the decision to take all the information I gathered and break it down into a process that involves simple and easy steps. I have taken my personal interpretation of the Chakra System and created a color and numbered coordinated series of gem infused anointing oils that will allow anyone with or without previous knowledge of chakras to use them successfully. In addition, the essential oil industry is growing exponentially and so is the pricing. 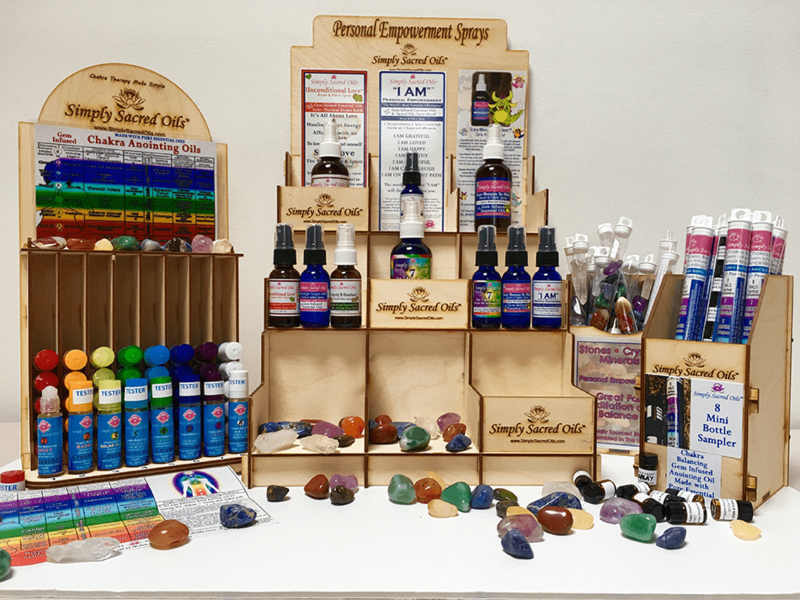 It is my intention with the entire line of Simply Sacred Oils™ products to make it simple to use, easy to understand and affordable for all. Simply Sacred Oils™ are produced for each Chakra 1-8 and all the varieties of Sage and Angel Invoking mist sprays were created to help the people that use them. The key was to make the process as simple as 1- 2- 3. Start with your intention: Set your intention by thinking about what you want to achieve. Visualize: See it in your mind using creative visualization (write it down and/or say it out loud whatever suits your mood). Accept the outcome: Know that your intention has manifested, and feel the joy that accompanies manifestation of your intention. Do this process when during the applications of any of the Simply Sacred Oils™. I know I have been divinely guided to do this work and to have the good fortune to be blessed with the group of friends and colleagues that have been placed in my path to be able to utilize their knowledge to tap into Spirit and cellular memory and bring these products forward. Another passion near and dear to my heart is working to eradicate bullying of the innocents through the Billy the Bull Foundation. In 2012, I encountered a stream of powerful and disturbing videos posted on YouTube.com depicting a distraught teenage boy who communicated his message of despair and suicidal ideation by holding up a series of cue cards that describe his feelings about being bullied. Having experienced bullying as a child, I felt compelled to become more involved in the anti-bullying movement. I posted the videos on my LinkedIn profile accompanied by a personal message asking others to help spread the word. My desire to bring greater awareness to this issue led to my developing what I hoped would eventually become a nationally recognized symbol against bullying: Billy the Bull. The concept of this superhero mascot developed over time. My thought was to create a symbol that, when displayed by someone on their car or their front door, would identify that person as a champion against bullying and an immediate safe haven for those who are bullied. Billy represents the trusted friend who lends his power to the support of the vulnerable and innocent. He fights the good fight. A majority of pure essential oils and blends will remain stable for many years. Some essential oils, such as Patchouli, Spikenard, Sandalwood, Patchouli Frankincense actually improve with age. To enhance the length of life of the products, bottles should be properly stored away from light, heat and cold weather and left tightly sealed at all times. Best result of use within 24 months of opening and proper storage. Important: If you are pregnant or nursing some oils may be emmenogogues. The above should not replace any current medications you are currently taking. None of the health topics presented have been evaluated or approved by the FDA. Use with care on the skin and avoid when exposed to the sun or UV rays. Keep out of the Reach of Children. Avoid Contact with Eyes.